A total of 1,774 children in Merton aged between four and 11 completed the Summer Reading Challenge by reading six books or more during the school summer holidays. 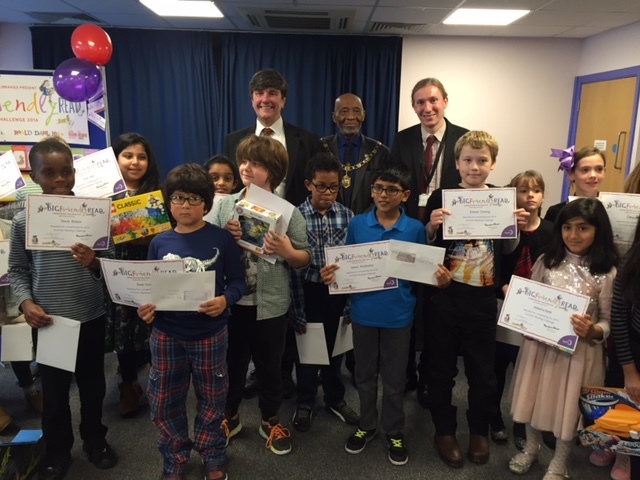 A group of children from primary schools across the borough who completed the challenge were presented with awards at an event held at Raynes Park Library today. The Summer Reading Challenge is run by the national charity The Reading Agency. This year’s theme was The Big Friendly Read in tribute to popular children’s author Roald Dahl ahead of the centenary of his birth on 13 September. In Merton the most popular four books by Roald Dahl which were issued during the summer were The Twits, The Enormous Crocodile, The BFG and The Giraffe and the Pelly and Me. Records from Merton councils seven award-winning libraries show that overall, 39,549 books were borrowed over the summer on child and primary school library cards. Merton was the first London borough to launch the library and schools membership scheme which issued every primary school child with a library card to encourage them and their family to visit their local library. This scheme is due to be extended to secondary school pupils in Years 7, 8 and 9 later this year.